What makes Rosetta Notes so good? Rosetta Notes products are all carefully selected for fountain pen and ink use. Every detail of the Swatch Book was carefully examined for the highest fountain pen compatibility - most importantly the paper. The ink color brilliantly pops off the page thanks to the 65# Smart White ultra-smooth, uncoated, 98 brightness card stock. The paper is extremely bright white, pH neutral, and acid-free for archival quality. Each book has 100 cards, 2" by 4" (50 mm x 102 mm) in size. Rosetta Notes products are milled, manufactured, and printed in Michigan, USA, and are an iPenstore.com exclusive. 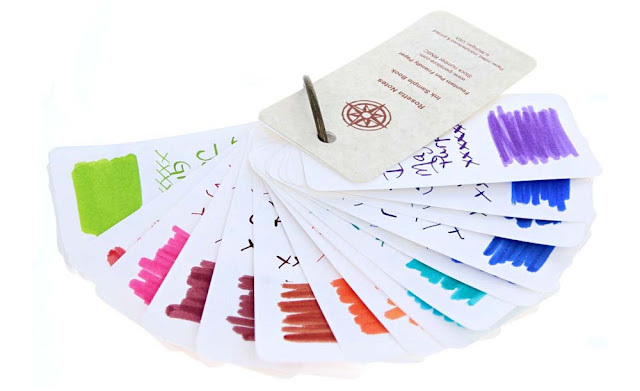 Each time you get a new bottle of ink, just take a minute to quickly jot down the name, and a color sample on one of the cards. The over-sized bronze ring can be opened and closed so you can easily add, remove or rearrange your swatches. Once a new sample is created, place the card back in your swatch book (sorted alphabetically, by color, or by your own custom organized chaos method!). You'll then have a quick and easy color reference when trying to find 'the perfect ink' for your writing project. iPenstore.com has over 700 different bottles of ink to choose from - so one Rosetta Note Swatch Book may not be enough! Click Here to check out our huge selection of inks, or contact us by email (support@ipenstore.com), by phone (888-747-7367), or in the comments below with any of your ink questions. 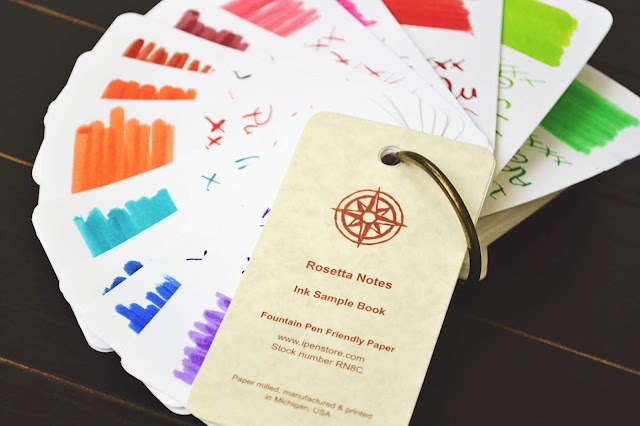 Want to see more fountain pen friendly Rosetta Notes products? Try Rosetta Notes Pocket Notebooks and Rosetta Blotting Cards and Sheets.